The Intercity-Express written as InterCityExpress in Austria, Denmark, Switzerland and, formerly, in Germany or ICE German pronunciation iːtseːˈʔeː is a system of high-speed trains predominantly running in Germany and neighbouring countries. 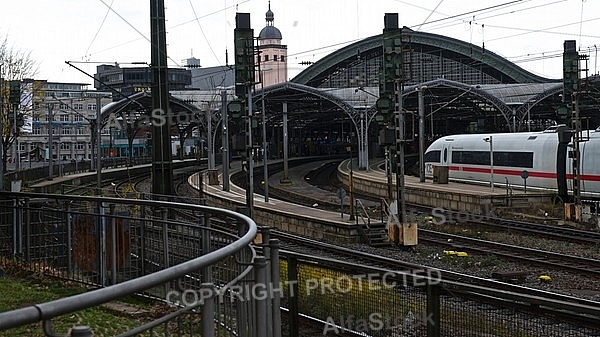 It is the highest service category offered by DB Fernverkehr and is the flagship of Deutsche Bahn. The brand name ICE is among the best-known in Germany, with a brand awareness close to 100, according to DB. Cologne is located on both sides of the Rhine River. The city's famous Cologne Cathedral Kölner Dom is the seat of the Catholic Archbishop of Cologne. The University of Cologne Universität zu Köln is one of Europe's oldest and largest universities. Cologne is a major cultural centre of the Rhineland and has a vibrant arts scene. Cologne is home to more than 30 museums and hundreds of galleries. Exhibitions range from local ancient Roman archeological sites to contemporary graphics and sculpture. The Cologne Trade Fair hosts a number of trade shows such as Art Cologne, imm Cologne, Gamescom and the Photokina. Cologne is located on both sides of the Rhine River. The city's famous Cologne Cathedral Kölner Dom is the seat of the Catholic Archbishop of Cologne. The University of Cologne Universität zu Köln is one of Europe's oldest and largest universities. Cologne is a major cultural centre of the Rhineland and has a vibrant arts scene. Cologne is home to more than 30 museums and hundreds of galleries. Exhibitions range from local ancient Roman archeological sites to contemporary graphics and sculpture. The Cologne Trade Fair hosts a number of trade shows such as Art Cologne, imm Cologne, Gamescom and the Photokina.Cologne is located on both sides of the Rhine River. The city's famous Cologne Cathedral Kölner Dom is the seat of the Catholic Archbishop of Cologne. The University of Cologne Universität zu Köln is one of Europe's oldest and largest universities. Cologne is a major cultural centre of the Rhineland and has a vibrant arts scene. Cologne is home to more than 30 museums and hundreds of galleries. Exhibitions range from local ancient Roman archeological sites to contemporary graphics and sculpture. The Cologne Trade Fair hosts a number of trade shows such as Art Cologne, imm Cologne, Gamescom and the Photokina.